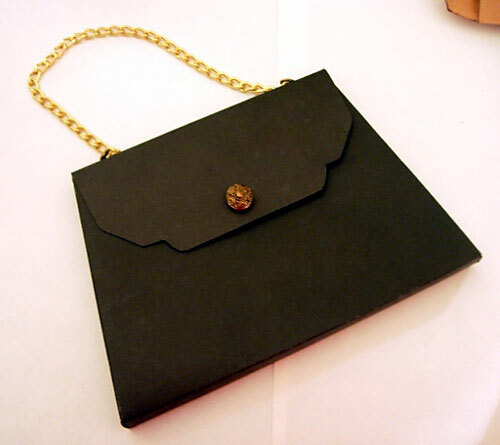 What makes this gift wrapping idea for a handbag so unique is that it is a breeze to make, yet oh! so chic. 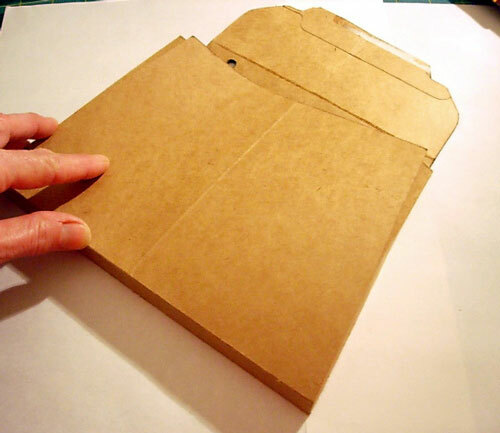 It is constructed from a file folder, the kind you buy at office supply stores with a center tab. Target, Walmart and Home Goods also have some colorful and patterned ones that would look very hip, so let your imagination run wild. The bottom of the bag is already made for you where the file folder is scored on it’s spine. 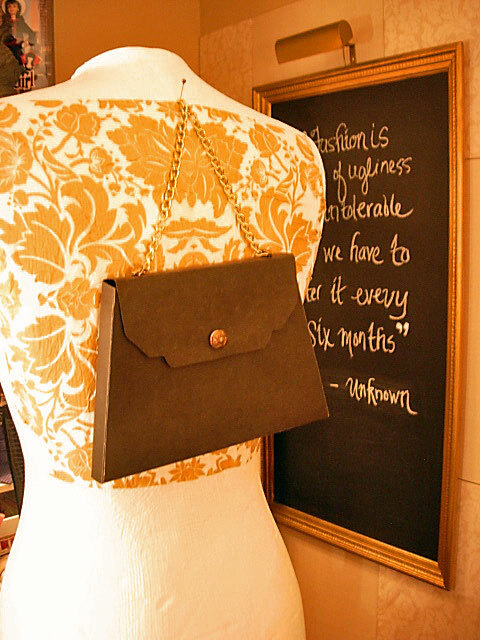 This bag is small, but still perfect for holding a gift card, lipstick, book, or a piece of jewelry. The brass-plated chain I used is called #250 Hobby Twist Chain, but any chain sold at a hardware store by the foot will do. You can also use an old beaded necklace found at a flea market to coordinate with the color of the file folder or even a strand of old pearls that have a jump ring attached to each end so that you can attach it to the bag. Who ever is the receiver of this bag will squeal, Ooh-la-la! with delight. The first template is in its whole form so you can see how it all goes together. It prints out smaller than a file folder which is about 11- 1/2 inches. 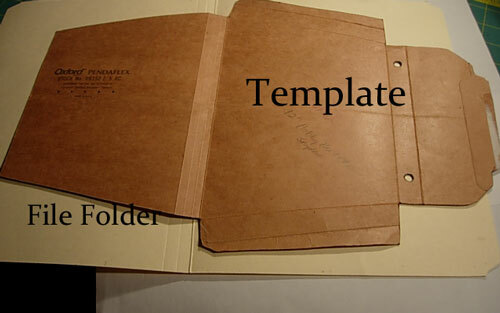 The template can be printed to any size, but the bottom section will always be the same width that has to be lined up with the fold in the center of the file folder to create the bottom of the bag. The other three templates are the same template, but broken into sections that you can tape together. I wanted to give you some options. If you have access to a photocopier, you can have the full template enlarged so it fits across the width of the file folder. 1. Print out template and cut out. Center template on folders score lines in the center of the file folder as shown and trace around the template onto the folder. Make sure to mark placement for handle and all score lines. I made a reusable template from an old file to re-use to make many gift-bags. I am using it to show you the first few steps in this tutorial. 2. Using a straight edge and an open pair of scissors, line up ruler along the score line and run scissor tip along ruler to score. Do not cut. 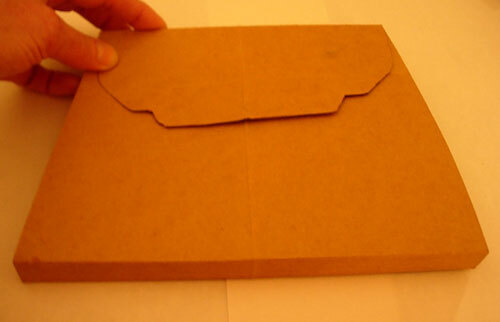 You can also score the folder with the opened tip of a paperclip. Fold. Repeat this for all marked score lines. 3. 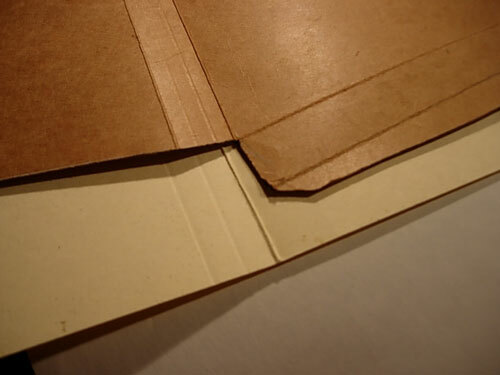 Fold ready-made score lines that are part of the file folder to create bottom of the bag. 4. 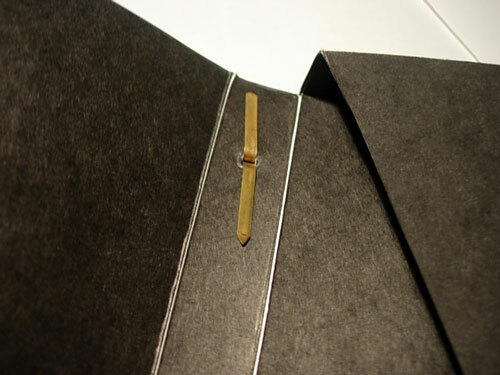 Use paper clips to hold in place until it is dry or use a thin line of hot glue. 5. Fold over top and punch holes where marked. 6. 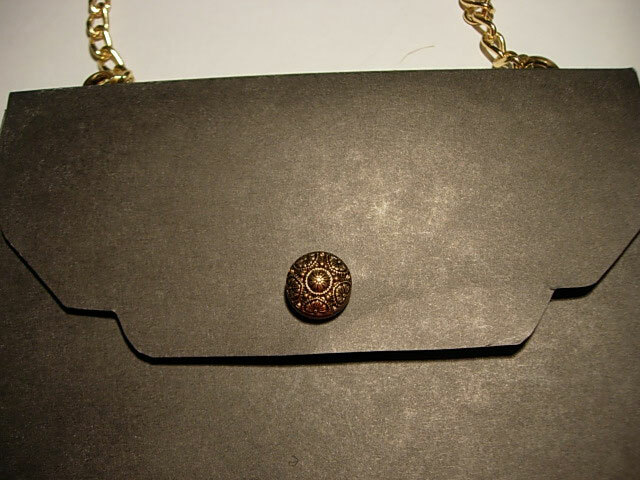 Place a brass fastener through end link on chain and put through punched hole. Spread fastener to attach. Repeat to attach handle to other side. You can see I switched from my brown template and am working on one made from a black file folder. 7. 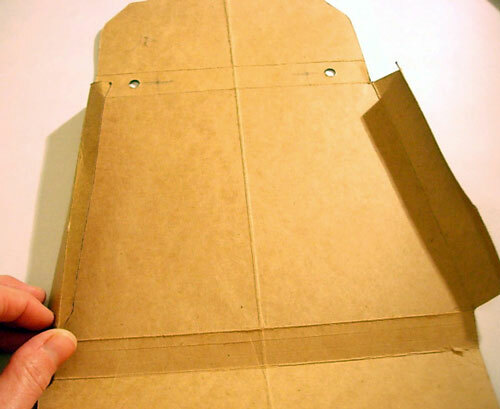 To cover fasteners, glue ¾” strip that is on the bottom right of the pdf. template to underside of top. 8. Stick Velcro dot on the front flap bottom center; close and stick other side of Velcro on the body of the bag. 9. Glue button on outside of flap to resemble a real handbag closure. If you can’t find a file folder in a color or pattern you like you can cover the file folder with decorative gift wrap or scrapbook paper to the outside of the file folder before assembling. Use spray glue to attach the gift wrap. This is a very old post (what’s new? I’m always late to the party), but I thought I would mention that using this template on wallpaper samples works great, too. Thank you for the template and the inspiration. Hi Laura – It is an old post that I had forgotten about. Thanks for reminding me about it and taking the time to share with me that you can make it using wallpaper. I may update the post and bring it back to life again. I accidentally happened upon your website here and am thoroughly enjoying myself…for the last 2 hours now! This is exactley what I have been looking for…diy on a budget with things you already own. Also, I, too am a garbage (treasure?) picker. I have no problem with grabbing someones throw away. I am always looking to change things up without spending alot (if any) money. Thrift shops, Goodwill and rummage sales are pretty much the only places I shop. I’m looking forward to more ideas from you. It is always so nice to find a kindred spirit – wish I could be your neighbor and we could chat all the time about thrifting, DIY, crafts, etc. FUN! You have made my day telling me that you just spent 2 hours on my site – xo. Thank you so much for connecting with me. This is too over the top cute!!! I’m so glad you shared this at the Pretty packages Party!! Gorgeous, at first I thought you use a Cricut Cartridge Forever Young. That’s so cool! You’re so creative! Thanks for linking up at my party. Hope to see you again this week! Wow, I love this! Thanks so much for yet another fabulous idea. I’ll be linking. Covering it with fabric would be very easy with spray glue, and there are so many fabric options to choose from to make each bag truly unique. Thanks for idea. this is totally cool, and I’m thinking that covering the folder with fabric would be easy & so glam. BTW, I have that same button in my button jar! Thanks for stopping by my blog, and I’m a new follower. I love this, can’t wait to try it. Thanks so much for linking up! This would make a very cute an unique party favor. Making the bag doesn’t take long at all. 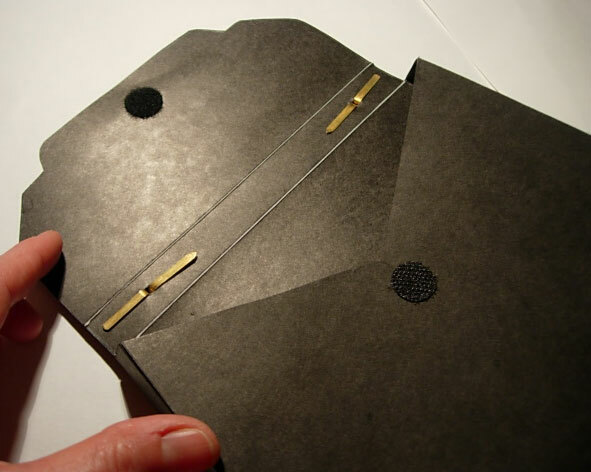 Once you have the template/pattern cut out making a bag from tracing the template onto the file folder to gluing the button will take less than 10 minutes. The first time may take a little longer. I SO love this! When I saw this, I new exactly which friend to give one too. And I agree with another commenter that this would be a great party favor with fun things inside. Holy smoke! This is wonderful. What a very clever idea… I love it. How long did it take you to make this? would be cute party favors! Hi Molly – thanks for the nice comment. I can’t seem to get the pdf to link up correctly. I am working on it and will comment back here when it is fixed. Sorry I wish I were good at the tech stuff, creative stuff – no problem. That is stinkin’ cute and total genius.